Owning a pool is one of life’s great pleasures. Not only can you use it to relax and exercise, it’s also a great place to throw parties for nearly any summer occasion. With so much fun comes a lot of responsibility, though. Making sure that your pool is clean and safe for people to be around can be time-consuming. If you’ve noticed that some of the concrete slabs around your pool have started to sink or are beginning to crack, you might need to have your concrete repaired or lifted. Call B & B Concrete Lifting today to find out how we can save your concrete from cracking into pieces or sinking and causing tripping hazards. We have decades of experience with concrete lifting and we take great pride in being able to save your concrete while saving you money. Because of all of the extra stress that your concrete goes through being next to your pool, it isn’t rare to see cracks forming or edges of a slab starting to sink. 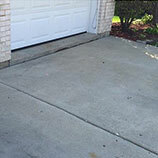 Concrete sinking and cracking is caused by a number of factors, including the erosion of the soil underneath the concrete slabs due to moisture from rain or from the water table, and from soil compaction. Soil compaction occurs over time as the weight of the concrete slab sitting on top of the soil begins to force the soil into denser clumps. When the soil is smashed together it loses volume and your concrete slabs sink. 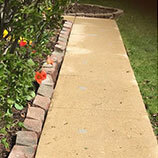 When the soil underneath your concrete is either washed away or compacted it can cause it to sink or crack because erosion and compaction never happens uniformly and therefore too much extra pressure is put on one side or edge and it sinks or cracks. While erosion and compaction are possible under any concrete, whenever you introduce extra moisture or increased traffic to a slab it can speed up or exacerbate these problems. Pools bring both extra moisture and traffic to a slab. Oftentimes, the heavy equipment required to dig and pour a pool can begin this process long before you actually notice this problem. If your pool has a problem with its drainage it could be causing your concrete problems, too. Add those factors and the amount of precipitation that we get around here, and there are a multitude of reasons why your poolside concrete slabs might be sinking. Knowing that it is important to keep the area around your pool looking good so you can enjoy it (or in case you are looking to sell your home in the next few years), you’ve probably wondered what the best course of action is. Maybe you’ve gotten a quote on replacing the concrete slabs and cringed at how high the number is. 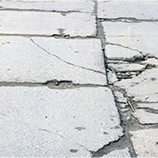 If you didn’t think it was possible to repair concrete that is sinking or starting to crack, let us show you how we can help. 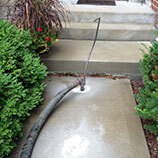 At B & B Concrete Lifting, our process is relatively simple but produces great results. After a consultation, we will drill a hole in your concrete slab and inject material underneath the slab that will fill in the void where the soil has been washed away or compacted. This material will expand and then harden, lifting the slab back to its original, even state while simultaneously stabilizing it and preventing new cracks from forming. Best of all, our concrete repair process is far less affordable than having your slabs repoured and saves you the troubles that new concrete can have, namely the amount of time it takes to pour new concrete, the possible damage to other areas around your pool, and no guarantee that a new slab won’t start to sink or crack due to a problem that wasn’t addressed by the company replacing the concrete. 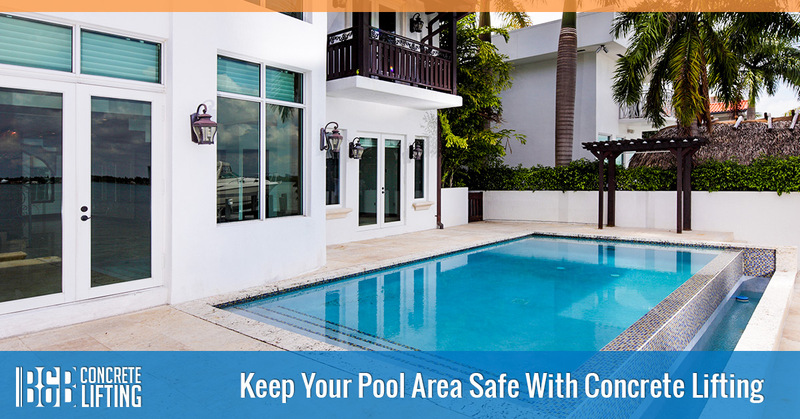 If you’re ready to make the area around your pool safer while also looking better, call B & B Concrete Lifting in Chicago. Our experience and dedication to doing every job right means that you can rest easy knowing that you’re being taken care of. Call us today to schedule a consultation and check out our before and after gallery to see some of the projects that we have completed that saved these homeowners a lot of cash while making their homes look comfortable and feel safe again.